We have a new instrument! 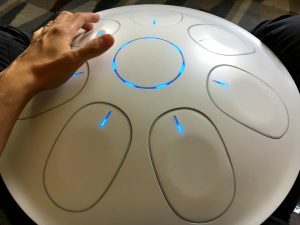 Some time ago we contributed to Kickstarter campaign of OvalSound, a project that was developing an electronic handpan. It’s a MIDI controller as well, with a huge amount of sounds and functions. New sounds, new inspiration and the possibility to play it live. Soon we’ll post the results!